Not sure how to format your cover letter? No problem, follow our step-by-step guide and examples and you’ll have an expertly formatted cover letter in no time. The purpose of your cover letter heading is to provide your contact information to the hiring manager. In a traditional cover letter, this information would be displayed in plain text in either a centered or left-aligned position at the top of the document. Alternatively, many modern templates feature design-heavy headers with alternative fonts and colors, bolded text, and icons. Name: Your full name should be the focal point of your cover letter header with a large font size and bold text. Address: Traditionally, an address would include your street address, city, and zip code. However, it’s acceptable to omit your street address and just list your city and state. Phone Number: If you’re applying for a job in a different city, state, or country, make sure to include the relevant area/country codes at the beginning of your phone number. Email Address: Use a professional email address such as yourname@gmail.com. Online Profile: In this digital era, you’re encouraged to include a link to your relevant online profiles, such as your personal website or Linkedin profile in your cover letter header. But wait–shouldn’t the hiring manager know their own contact information? Of course they do (at least we hope so)–and that’s why it’s become acceptable for candidates to exclude this information when submitting a digital application. In which case, you would start your cover letter with today’s date, followed by a simple greeting for the hiring manager–but more on this in the next section! You only get one chance to make a first impression–so, make sure you start your cover letter with the appropriate salutation. Ideally, you want to address your cover letter to the hiring manager in charge of the position you’re applying for. You can often find their name in the job description or on the company’s website. If you can’t find it, don’t panic–try calling the company and asking for the hiring manager’s name. Want more information cover letter greetings? We’ve got you covered with a complete guide on how to address your cover letter. Grab the hiring manager’s attention. List what position you’re applying for. Describe where you found the job posting. Offer a sneak peak into why you’re the ideal candidate for the role. Please accept my enclosed application for the position of dental assistant at [Clinic Name]. I noticed your job posting on [Website Name] and am happy to say that my 4+ years of dental assistant experience matches your clinic’s needs perfectly. If you’ve been referred to this role by a mutual contact of the hiring manager, include this information in the first paragraph of your cover letter.A referral paired can help you get your foot in the door for an interview. So, don’t shy away from including this professional favor in the beginning of your cover letter. Now that you’ve covered the basics, it’s time to delve into your experience and accomplishments. But, this section isn’t just an opportunity to boast about yourself–match your qualifications to what the company is looking for. Use the skills, experience, and qualifications listed in the job description for inspiration. I noticed in your job description that you are looking for a candidate that will require very little training and supervision. After gaining 4+ years of dental assisting experience, I can guarantee that I am completely familiar with the routines associated with patient care, record keeping, performing dental work, and handling scheduling, billing, insurance, and even doing inventory maintenance. If you’d like to exceed the expectations of the hiring manager, do some research on your potential new employer. Determine the current state of the industry, the company’s position in the market, and if possible, their future plans. Write a paragraph detailing how you fit into their game plan. Explain how you can propel the company forward and assisting in reaching their future goals. Thank the hiring manager for their time & consideration of your application. Restate your contact information, including your phone number and email address. Finish with a compelling call-to-action, that prompts the hiring manager to invite you in for an interview. [Optional]: Briefly reiterate what makes you a strong candidate for the role. I would love to have an opportunity to join the team at [Clinic Name]. I am looking forward to having a more detailed discussion with you about how I can join your team and help you achieve your goals. You’re almost done! Just a few closing formalities to take care of and your cover letter will be complete. Follow this guide to help you wrap up your cover letter correctly. A salutation, or complimentary close, is your opportunity to bid adieu to the hiring manager. Be sure to use a professional, yet friendly letter close. The final step is to authenticate your cover letter by signing below the closing salutation. If you’re submitting a digital copy, it’s not necessary to include your signature–instead, just type out your first and last name. However, if you’re old fashioned and want to include one, it’s appropriate to include an e-signature at the bottom of the document. Need an eye-catching cover letter template? Look no further, we have 40+ Free MS Word templates for you to choose from! When it comes to your cover letter, first impressions matter. Follow these guidelines to make sure your cover letter is up to standards. Font Style: Keep your cover letter font clean and professional. There’s no shame in using one of the classics, such as Times New Roman, Helvetica, Arial or Verdana. Avoid using fancy fonts that might be deemed as unprofessional by a hiring manager–or even worse, can’t be read by an applicant tracking system. Font Size: When selecting a font size, aim for the middle course and avoid extremes. Use no larger than a 12 point font and no smaller than a 10 point font. A smaller font will cause the hiring manager to strain their eyes while a larger font might be regarded as unprofessional. Spacing / Margins: Err on the side of caution and use margins between 1” – 1.5”. If you’re strapped for space, it’s okay to make slight adjustments to the margins; however, avoid making large adjustments that give your document a stretched or crowded appearance. File Format: If you’re submitting a digital copy of your cover letter, it can be difficult to know which file format to use. Unless otherwise stated, most companies expect you to submit your cover letter in a PDF format. This is because PDFs cannot be altered, they don’t pose compatibility issues, and they can be read by ATS. When saving your cover letter as a PDF, make sure to use an appropriate name such as Your-Name-Cover-Letter.PDF. Cover Letter Length: How long should a cover letter be? As a rule of thumb, your cover should be between a half page and a full page (usually this means between 250-400 words).- Above all, it shouldn’t exceed one page in length. Stick to the essentials–use the space to comprehensively, but concisely, showcase your most relevant qualifications to the role. If your letter is too short, the hiring manager might question your interest in the role. If you submit a three-page document, the hiring manager likely won’t have time to read it. Your cover letter is a text-heavy document–which means lots of room for mistakes. Reduce the margin of error by having a third party review your letter before hitting submit! Let’s face it, you’re probably not going to be printing your cover letter and sticking it in the mailbox in 2019. The majority (it not all) of the cover letters you send are going to be digital. If the job posting has an “upload” button or has asked for a file attachment, then you don’t need to make any changes to your cover letter format. Simply convert your letter to the appropriate file and hit upload (more on this above)! However, if you’re required to send your cover letter in the body of an email (not as an attachment), you’ll need to make the following adjustments to the format. Craft a Professional Subject Line: Hiring managers receive tens, if not hundreds, of applications for each position via email. Therefore, the subject line of your email needs to clearly state your name and the position you’re applying for. For example, “Sales Associate Position – John Smith”. Relocate Your Contact Info: It’d be awkward to start an email by stating your name, address, email, phone number, and online profile–your cover letter is no exception. Instead, relocate this information to below your salutation. Make sure you write the details out and don’t rely on your e-signature. Remove the Date & Employer’s Contact Info: Since you’re sending it via email, there’s no need to include these old-school details. Skip straight to your greeting to the hiring manager. Subject Line – Use a professional subject line that clearly states the position title and your name. 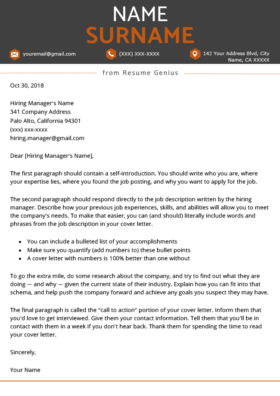 Greeting – Begin your cover letter email by politely addressing the hiring manager by name. Contact Information – Provide your contact information at the very bottom of your email. The “Intro” Paragraph – Introduce yourself & express your interest in the position. The “Hard Sell” Paragraph – Prove how qualified you are. Reference the job posting. The “Action” Paragraph – Thank the hiring manager and express interest in an interview. 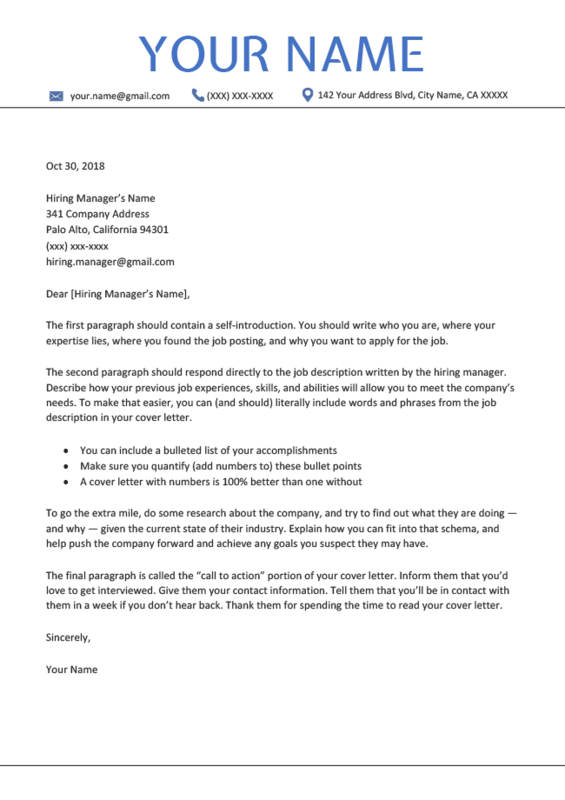 Check out the formatting on this Marketing cover letter to get an idea of what the finished product should look like. I am writing you in response to the Sales Associate job advertisement listed one your website. I would like to convey my interest in the position as I am confident that I possess all of the necessary qualifications to fulfill the job role. I would like to discuss your sales associate position in detail and would be happy to come in for an interview at any time that’s convenient for you. I am available by phone or email. Thank you for your time and consideration. I look forward to hearing from you. Don’t want to bother with this tricky formatting? Skip straight to the finish line with one of our eye-catching cover letter formats–no adjustments necessary. We’ve included a few of our most popular examples below, but if you want more options–don’t worry, we’ve got 40+ free downloadable MS Word templates for you to choose from! Congratulations, you’ve covered it all! You’re ready to create an aesthetically pleasing and expertly formatted cover letter. Good luck on your future job prospects! If you have any questions about our content, or you think we’ve missed something, leave a comment below!